Much like a delicious ice cream sundae, communicating with colleagues should be a treat. At least, that’s what Molly Moon Neitzel thinks. Neitzel opened her first ice cream parlor in 2008. 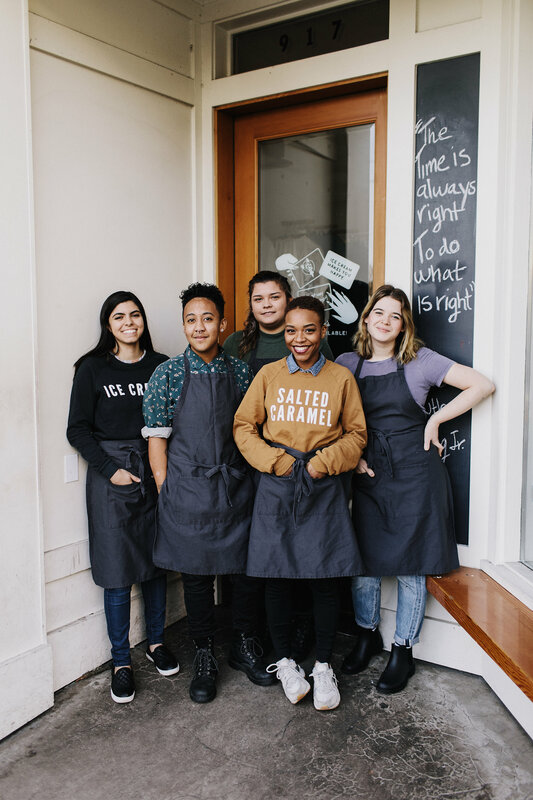 Fast-forward a decade, and Seattle-area Molly Moon’s Homemade Ice Cream has anywhere from 80 to 170 employees, depending on the time of year, and expanded to eight locations. From large open kitchens to a scoop shop nestled inside a laundromat and a seasonal walk-up window connected to a cookie bakery, each has its own uniquely welcoming, whimsical style. Neitzel and her team don’t just know a lot about ice cream. With that many shops, they see the importance of seamless, straightforward coordination between stores. “We use Slack as our everyday communications tool,” explains Eric Anderson, an area manager who oversees four Molly Moon’s locations. Molly Moon’s employees—they’re called the Mooncrew—use companywide Slack channels to do everything from manage operations, inventory, and deliveries, to logging maintenance and repairs. Slack has replaced intrusive group text messages that were impossible to search. Today the team has Slack channels set up for managers and shift leaders to share information, and there are also distinct channels for every store. Molly Moon’s employees—they’re called the Mooncrew—use companywide Slack channels to do everything from manage operations, inventory, and deliveries, to logging maintenance and repairs. Moon Crew members rely on Slack to share critical store-specific information internally, such as opening and closing procedures. Plus, every shop needs to receive and easily search company information about new products or ingredient lists. For example, special flavors and sundaes have a dedicated #seasonal-flavors channel available to all employees. 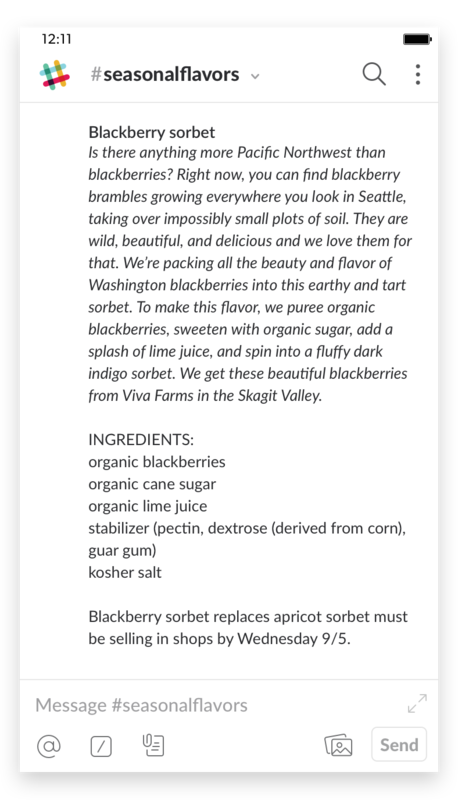 Transparently sharing those types of details in Slack means every staff member in every shop can quickly look up ingredient lists for customers who have allergies and dietary restrictions. Eliminating multiple overlapping group text messages in favor of Slack channels has cut down on distractions and improved how relevant information is shared. “No one at the scooper level wants or needs to receive a text message at 10:30 p.m. about why the safe won’t open,” says Anderson. That said, most Moon Crew members do want general updates about problems and successes across locations. With Slack, individual employees can skim threads in specific channels and catch up on pertinent workplace details on their own time. And Moon Crew channels aren’t always strictly business. During Pride Month, staffers used the #moon-crew-pride channel to organize the company’s celebration of its LGBTQ community. As the manager of four stores, Anderson can’t be everywhere at once. Being able to remotely monitor team conversations across locations means he can quickly respond to issues and let his teams know he’s always available to offer guidance. “The shop-specific channels have made me more visible to my team, and in the business overall,” Anderson explains. Handling operational issues, including maintenance and repairs, is easier now too. Molly Moon’s integrated Slack with project management software Trello, and that lets shop managers create individual reports about facilities or equipment issues, attach a photo, and rank the order of importance. It serves as a record of recent repairs, as well as a way to track longer-term problems with anything from the fudge boiler to the freezer. When the busy summer season approaches, there’s often simply not enough time to have meetings about all 20 to 30 new candidates needed at each Molly Moon’s location. “There are times when we really need someone to work in a store, and it can’t wait a week,” says Anderson. The team has integrated Slack with Hireology, a hiring tool that pools the job applications from individual shops and gives managers a single place to review them (sparing managers endless meetings in the process). Sharing candidate information in the #hiring channel means if one store is all staffed up, there’s an opportunity for an applicant to be hired at a different location, ensuring each location is well-staffed for the store’s high season. At any organization, onboarding new employees can feel like a game of Whac-A-Mole, answering the same questions that have come up for years. Anderson appreciates the searchable archive of institutional knowledge available in Slack, which functions like an employee handbook. “There’s always some detail that people need to do their jobs but isn’t important enough to warrant a meeting,” he says. Being able to search and share FAQs in Slack means everyone feels empowered to find answers about topics such as employee benefits and getting a shift covered. As a result, Anderson ends up answering fewer questions by phone and text. “With Slack, anybody in the company can look up past communications and learn what’s already been covered,” he says. And that means everyone has more time to focus on the detail that matters most: the ice cream. Brittany Shoot’s parents once owned a Baskin-Robbins. When she was born, they announced her arrival on the shop’s marquee letter board.